Ask fellow campers about "Liberty Haven Ranch" and nearby attractions. In the interest of kindness and because these folks will know exactly who is writing this review, since they have very little business, I'll just say that not many of their promises on their website are actually true. Maybe the bunkhouse is ok, but our RV site was 1/2 mile from the main house--our choice since we didn't want to attempt an "S curve" back-in nearer the main house where what they have is located. Pull-thru was fairly level. Looked like it had never been used. Internet was MIA for the most part, and they apparently could not fix it. Water tasted pretty bad. Nobody else camping nearby. Just a neighbor's house and horse paddocks. Stars were just okay on a new moon nite, so don't believe that starry skies promise either. It is way too close to Phoenix for dark skies. If it is a dude ranch, better bring your own horses, since they have only one, plus 1 mule. No puppies at this time. They are better advertisers than providers, and they sucked me in. Worth maybe $10, not $25.00. If all you want is water and electric, nobody else around except a neighbor and a couple of horses, no internet, no sewer, bad water for drinking, and nobody paying you any mind, this might work for you. I would have liked to see what they advertised (horses, mules, dogs, stars). That is why I chose this place. Disappointing. 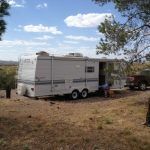 We camped at Liberty Haven Ranch in a Fifth Wheel. The advertising complaint puzzles us. We don't advertise as a "dude ranch" or offer trail rides. 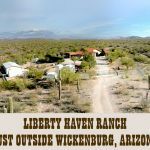 (Actual dude ranches in Wickenburg start at $270/night.) Our horse-camping guests do bring their own horses. We are "far from city lights;" but even at 45 miles from central Phoenix there is a minor glow to the east (blocked at our prime viewing areas—but no one ever asked). We can't guarantee puppies at all times (our girls are now pregnant). We don't advertise sewer—this guest declined our free gray discharge. WiFi was repaired within four hours of complaint; logs show they used it freely thereafter. We've had no water taste complaints, ever (quite the contrary). Other than the WiFi, none of the listed issues were reported to us. The guests remained hitched at all times, never visiting the area where our animals and amenities are, so they experienced only our desert solitude. We're eager to please, but first we need to hear about any issues. We regret our guests were unsatisfied. This is a 175 acre ranch, owners are very nice. They hooked up a new WIFI router for us. Camping is water and electric,with grey water dump. We camped at Liberty Haven Ranch in a Motorhome. This is a desert. IF you want quite, here is a great place. Very few sites. Mainly cactus and varmints. A small herd of wild burros live there too. Has a short grass landing strip and several shooting ranges. Sky is so clear at night you cannot pick out constellations, there are TOO MANY stars !!!!!! This park is actually a small "dude ranch" with a handful of trailer slots as a side business. 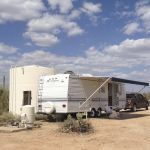 The two close to the ranch house have water and 30A power, or you can dry-camp on several others farther out on the property. There are no sewer hookups or rest rooms. There is a clean outdoor stall shower near the pool, which we used since we were the only guests here. The WiFi system worked fine -- the owners give you the WPA password to connect, and you're off and running. The pool was huge and warm. There was no cable, but we got about 20 stations over the air. The park is very private and quiet and the native desert scenery is spectacular. We signed up for an early morning trail ride and we stayed over an extra day to use the gun range (first time we've seen one of those at an RV park!) It was a novel campground, and if I am back that way (hopefully in a cooler season) I would definitely stop there again. We camped at Liberty Haven Ranch in a Travel Trailer. This is a desert. IF you want quite, here is a great place. Very few sites. Mainly cactus and varmints. A small herd of wild burros live there too. Has a short grass landing strip and several shooting ranges. Sky is so clear at night you cannot pick out constellations, there are TOO MANY stars !!!!!! Are you affiliated with Liberty Haven Ranch ?